The Harbor Freight 10 x 12 greenhouse kit supplies a steel base to be placed directly in the ground. It's a rectangular C-shaped piece, the idea being that the hollow inside of the base gets filled with the earth and gravel of your greenhouse floor, and that anchors the greenhouse. The instructions don't mention using metal stakes, concrete piers, or anything driven into the ground for extra anchoring. Most folks believe this greenhouse needs much better anchoring, and would rather not bury a steel foundation in wet ground. The popular solution is to build a wooden foundation, anchor it into the ground somehow, and mount the steel base on top. Everyone finds their own way to do this, but most use at least 4 x 4 sized timbers for the base. Tip: Lay out the steel base pieces on the ground and measure them before you assemble your wooden base. The measurements listed in the manual are for a trench in the ground, not the actual size of the steel base. 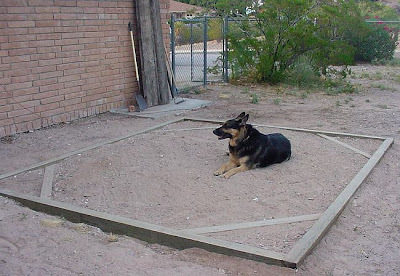 We live in a warm desert climate, and our area was flat, so we kept our foundation simple. We used pressure-treated 4 x 6 timbers on edge, set into a shallow trench, levelled and squared. Temporaried with long screws, then drilled and bolted at corners. General Omar Bradley (large hairy dog in center) holds down the dirt. After driving into ground, stakes were anchored to timbers with strapping and bolts. Not very fancy, but we think the aluminum frame of the greenhouse will fail before this foundation goes anywhere. Pressure treated 4 x 4 timbers are cut to fit diagonally inside the corners of the 4 x 6 foundation. This should help keep the foundation frame square (especially as the wood dries.) We set these a bit lower than the 4 x 6 timbers, and they should be covered up by the gravel floor later. Four corner braces in place. Bradley holds down the interior dirt. The steel base that comes with the Harbor Freight 10x12 kit looks to be powder-coated, in a silver color. It's not as flimsy as we thought it would be, but the shape of it does allow flex, which we'll deal with later. Before we bolted the base pieces together, we drilled holes about 18" apart in the bottom of each piece (closer in the corners) with a cordless drill. Then we bolted them together as per the kit, sitting the base on top of our wooden 4 x 6 foundation. As a barrier between the steel base and the pressure treated wood, we used polyethylene foam sill insulation (Lowes, 50' roll, 3 1/2" wide, for under $5.00.) I cut it in half since I didn't need the full width, and slid it under the metal base. We checked for squareness and screwed the base to the wood. Later, I trimmed off the extra insulation with a box knife, inside and outside. You can check squareness by simply measuring diagonally from corner to corner, and hopefully the two measurements will be the same. If not, slide the pieces around until they are, and then screw them down. Squareness is important throughout this kit! Update: I had hopes the sill insulation would compress with the weight of the structure and form a seal to keep out water, but no luck. I had to go back later and caulk the seam between the wood and the steel base, inside and out, with clear silicone caulk. That stopped rain water from seeping in under the steel base. Now it's time to start using the manual. We'll assemble the greenhouse as per the manual, and then, before we attach any of the polycarbonate panels, we'll add some important bracing to modify the frame for strength. Click here to go to Part Three: Assembling the Greenhouse Walls. Hi Bruce, some folks do use clear caulk to secure the panels in place, but I've read mixed reports about how well this stands up to wind. In my case, I didn't want to seal my panels in place with caulk, because I like to be able to remove them (mainly to replace them with screens in hot weather.) Even if I did caulk some panels in place, I'd still secure them with a screw or two in the cross braces, because I feel like that's the best insurance against our strong winds here. I'd be worried about depending only on caulk and clips, but that's just my own bias. Closing the top and bottom of the panel with caulk might work (instead of using aluminum tape or special polycarbonate tape available from greenhouse supply stores.) However, some say it's best to have small airholes in the bottom tape, so any moisture that accidentally gets trapped in the small poly panel chambers has a way out. I'm honestly not sure how critical this is, and it may depend on your climate. Thank you for posting this. I am intereted in buying two of these and do you think that I can add them together to make it 24 feet long? I was going to build another hoop house at our new home but then I saw this. The cost won't be that much more than the hoophouse if I was going to install twin wall glazing. I also recall reading a comment that there might be merit to leaving an internal wall in place between the two structures, if you have plants needing different winter temps (some being more hardy than others.) Just a thought, and hope this helps! I built this greenhouse last summer and your site was a giant help. You have to understand translated Chinese to use the instructions that came with it. I gave up on the clips that are intended to hold the plastic panels in place, they are a cruel joke. I used self tapping screws and since the aluminum uprights are butter grade, it was simple, fast, and they hold up against the wind. I have never had any luck with sliding doors so I just converted them to regular. Simple to do. Overall, with your help this kit is a real bargain. Heck, I grew watermelons in Olympia Washington. I am sure it would be possible to join two of these kits together, or as many as you would like for that matter. The foundation would get a little tricky and you might have to add an upright support in the middle if you live in snow country. I think you could even put the door on the side with a little work. I am thinking about buying one of these greenhouses. I love your threads on the modifications you made. Just curious how your HFGH has stood the test of time? Are you still happy with it? Yes, we are closing in on 6 1/2 years, and I'm still happy with it. I keep plants inside mine 365 days a year, and in the winter I really pack it full with plants that summer on our patios. Of course, to use it year round I had to invest in heaters and fans, but it was worth it to have a greenhouse I can use all year. Be sure to read my October 31 2013 comment on Part One of this blog, as I mention a product made by Top Secret Coatings. This clear roll-on protective coating may have promise for improving the life of the Harbor Freight panels. One Colorado poster to the GardenWeb greenhouse forum recently posted that he used this product on his new HF panels, three years ago, as he built. He states he has no deterioration, even on panels that have never been protected by shadecloth, so it might be a promising solution. I used it two years ago, on my new roof panels (which are under shadecloth, all year round.) So far, no visible deterioration on my panels either. This kit is not for everyone, because it does require modifications to withstand winds. You must screw the panels down, in my experience, and the other modifications for strength (originally posted by others, on GardenWeb) have served us well. However, if you're willing to do a little extra engineering, and willing to deal with the panel problem (either by replacing in time, or possibly by trying the protective product I mentioned) it's still a very good value. I have never had a greenhouse before and didn't know anyone with a greenhouse. Without the low entry price of the Harbor Freight kit, I would have been too afraid to invest the money in a hobby I didn't even know much about. It has been a super way for me to learn. And so far, I'm not planning to replace it with anything else. Thank you so much! It is very encouraging to hear that you are still pleased with the unit. Thanks again for all of the great advice!!! thank you so much for all the helpful info. I plan to install this on an existing cement slab. 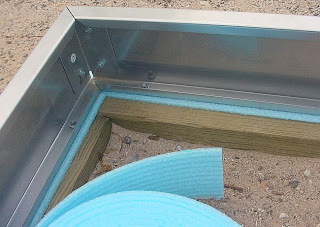 Do I still need to put a 4x4 pressure treated wood base or can I omit that and just screw in the HFGH aluminum base directly on the cement slab. thank you. Kicking it around, we think the only question is how tricky it will be to keep the steel base perfectly lined up and square as you secure the masonry anchors/bolts into the concrete. It might be a little less fussy to secure a treated 2x4 flat first, muscling those anchors into the concrete, and then finesse the squareness of the steel base on top of the wood, making adjustments if necessary. If the base isn't quite square, it will make lots of problems for you later in the build. It would depend on how comfortable and experienced you are with getting the anchors into the concrete. As long as you can secure it well and make sure the base is perfectly square, it should work fine. Thanks for documenting your build. I am having an issue I can't find answer for and I'm hoping you can provide insight. The instructions say to attach the floor plates to the base plates using the clips that go under the lip of the base. The illustrations show the floor plates being fastened to one another with the nut end of the bolts down. There are no holes in the base plate so the net result is a crown to the floor plate. Should there be holes in the bases plate for the bolts to go through or is the crown a necessary part of the construction? I am baffled. ....disregard my last question, I see the solution in part 3. Thanks again. Thank you so much for having this blog. This will help me a ton! 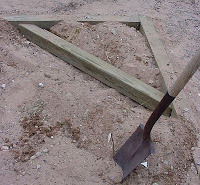 I'm planning on constructing a frame like yours for the foundation. However, my frame will be sitting on concrete, not dirt like yours. Can you recommend a way to secure the wooden frame to the concrete? The concrete is about 2" thick, I believe. I can drill holes in stabilize/fasten the wooden frame through the holes. What kind of stake and/or fasteners are good to use in this situation? My husband's thoughts are that 2" thick concrete might not have have the steel reinforcement common to a thicker slab. A lot depends on the integrity of the concrete (condition, age) but it might not be as strong as you'd guess; it's hard to know without seeing it. One idea is to drill holes through the 2" of concrete, and use those holes for heavy pieces of rebar (as we used, in the photos above.) The rebar stakes could be driven through the holes in the concrete, and deeply into the ground below. 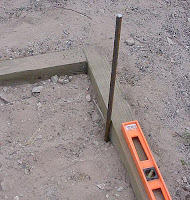 These stakes could then be anchored to the sides of your wooden foundation, as we did above. This is just one idea; maybe others will post here with more suggestions. What a great idea! Why didn't think of that? Guess that's why I'm a newbie. The concrete was poured about 6 years ago at the side of my house, just to have a clean surface, rather than dirt. I have no idea how thick it is. I'll try the rebar method. I think I'm going to make a foundation out of 6" x 6" pressure treated redwood. This way the GH will be higher off the ground, and I'll gain a little more height for my taller trees. One problem I'm having is that the concrete surface at my house is not flat. It's sloped away from the house for drainage of rain water. Do you, or your husband, have any idea on how to have the wood foundation level? A novice idea of mine is to shove in some pea gravel under the wood to help level it. Once I fastened the wood foundation to the ground with rebar, the gravel is not going anywhere. Woops, sorry for misspelling your name, Darren! The largest gap is no more than 1/2". Ok, brainstorming, we were trying to come up with a way for the 6x6 pieces to be in solid contact with the slab, at least at periodic intervals. On the side with the 1/2" gap, you could screw pairs of 3/8" lag bolts into the bottom of the 6x6", and adjust them to the correct height, so the wood was supported. On the two adjacent sides, which will have a gap that varies in size, you could also use a few lag bolts at intervals, and screw them in at different heights to accomodate the changing gap size. Then gravel could still be used under the wooden beams, as it would flow around the lag bolts. And/or, we'd probably also brainstorm a bit about some kind of insulating material to stuff under that gap, maybe before packing in any gravel, just because we tried to avoid easy air infiltration (we heat during the winter.) It would need to be something resistant to moisture. Maybe this will give you more ideas; we often find that inspiration strikes with even better solutions, once we're in the process! Also, just as a reminder, we know you're aware of how important it is to make sure the wooden foundation is level before erecting the frame. The frame itself is not rigid enough to be unaffected by a foundation that's out of level. If the foundation was not level, you'd be able to do the initial building just fine, but you'd run into problems later as you tried to add the angle braces and the poly panels themselves. Checking to make sure everything is plumb and square, as you go, is time well spent! Another idea that I just thought of is to make another slab to create a level base. I'd make a frame using 2" x 2" wood, forming a rectangle a little larger than 12' x 10'. Pour in a few bags of Quickcrete, then put the 6" x 6" foundation on top of this new & level slab. What do you guys think of this? Personally we wouldn't go that route, ourselves. 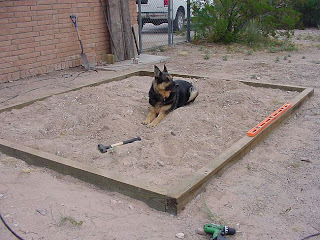 There might be some good concrete leveling products out there, but we're just not knowledgeable to be enough help on that point; I think most may be intended for indoor use...? Model 93358 is the older version of the 10x12 kit (like ours.) Model 69893 is the newer version of the 10x12 kit. There don't seem to be many differences between the two, but there are some redesigned parts. I can't think of any reason to value one over the other, functionally. I've had a few folks email me with questions because they were using a manual that went with the other kit. Not sure if HF is shipping kits with the wrong manual; it's just something to be aware of, if it seems the parts in your kit don't quite match those shown in your manual. You can download both 10x12 manuals from the HF website, in any event. Great article, helped we a lot. 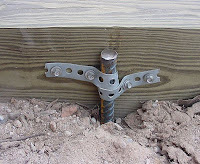 Question... what is the rebar "strapping" you use to attach rebar to wood base? I looked all over Home Depot and could not find any. Is there a technical term? That is plumber's strapping, or pipe hanger strapping. It should be available in the plumbing section. Back again Richie. My husband said I should add that the plumber's strapping we used is not really rated for being used underground; in a wet climate it might rust in a few years. We are in a hot dry climate so we can be less worried about such things. You could also use stainless wire secured to bolt heads in the wood; the folks at home depot might have other suggestions if you ask for a more weather resistant version of the plumber's strapping...if you live in a climate with more moisture. Awesome blog! I just finished my foundation. Pressure treated 4x6 on edge over solid block with gravel base. Thanks for all of your help! Mudhouse thank you for doing this. I am super impressed at the detail you have put into this blog. I was questioning buying one of these gh but after reading (and re-reading) this a few times my wife and I decided to buy one. I'm building the base this weekend and have a crew lined up for the following weekend to help "raise the barn". I have shared this blog with all of them so no one gets any bright ideas while we are building it. haha. Your instructions are way better than the ones in the box, thats for sure! p.s. the weather is great this time of year on the NC coast if you and your husband want to come down and help with the build! Thanks Joe, glad you could find some help here. I know some parts of my blog are a bit outdated after all these years, but hopefully it can still be helpful. Feel free to post back if we can help. Your offer to enjoy the NC coast was tempting; Mr. Mudhouse and I discussed coming to help, but a quick look around here reminded us we'd better deal with our own list of long-overdue projects! I'm looking forward to freeing up my plants from the greenhouse pretty soon; they're ready to stop hiding from winter temps, and get back out on the patios. Good luck with your build, hope you have fun along the way. Yes, there are now two versions of the Harbor Freight 10x12 greenhouse. They redesigned the kit at some point, with slight changes. For some time, both versions have been for sale through HF. There are slight differences between the older version I have (model 93358) and a newer version (model 69893) that you have. I have both manuals, and I believe you have model 69893, if your original panels are 2' by 6'. The other one, 93358, has roof panels that are 1'11" by 5'9". They've sent you the roof panels for the wrong model. If you still have your manual, it will say on the front which model you have. Unfortunately, when you order replacement parts, you have to be super careful to tell them which model of the 10x12 you have. Of course, an intelligent company would alert you to this potential problem, but apparently they don't. And to make it even worse, both versions use the same part number (Part 60) for the roof panel, even though it's two different sized panels, depending on which model you have! Madness. For a long time they had both manuals listed on their website, but now they only show the manual for model 93358 (no idea why.) If you need a manual for your greenhouse 69893, you can call HF and ask them to email you a PDF, I believe. If you did, the part list in that manual would show roof panels that are 2' by 6'. I'm afraid you'll have to call them and tell them you need roof panels for version 69893, not the roof panels for model 93358 that they shipped to you. I'm sorry to be the bearer of bad news, but I'm pretty sure that's what has happened here. Please let me know if I can answer any other questions. Hello Im wanting to build one of there 10 X 12 green houses too, I am wanting to make 4"
Unfortunately, Harbor Freight's lack of consistency between models makes this kind of answer almost impossible. There are currently two different versions of the 10x12 kit being sold. I think one is being phased out, but both still show up in stores. The two versions have different model numbers, and there are slight variations in parts between the two model numbers. There's a thread ongoing right now in the Greenhouse Forum of Houzz. Two folks are in the process of joining two 10x12 kits together, and they're doing a bang up job of discussing ways to do it, with photos. It would be a great place for you to read, and possibly join in. If you don't have a membership at Houzz, it's easy to register and no fee. You can read without joining; just need to join if you'd like to ask these folks for any questions.